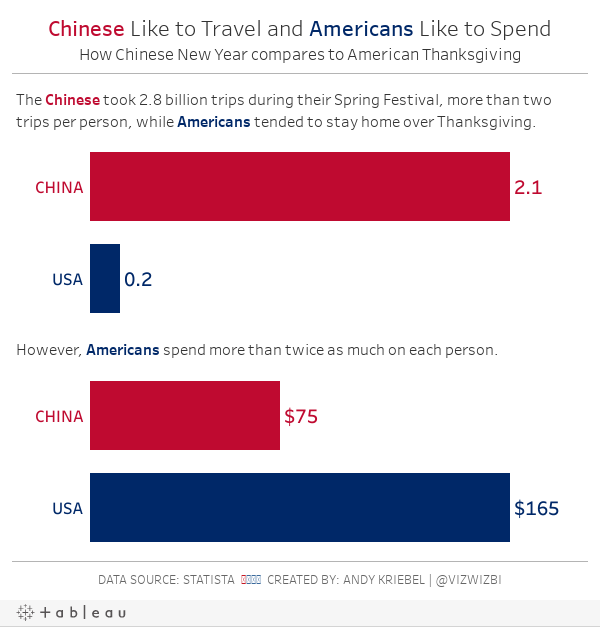 This week, Eva chosen another viz from Statista, this time the chart attempts to compare Chinese New Year with Thanksgiving in the U.S. Comparing circles is very difficult; what are we to compare? The size? The diameter? Either way, it's very difficult. Make the numbers comparable. China's population with way bigger than the US. Converting them to per capita would make for better comparisons. The trips and spending data looked like the most interesting, do I discarded the viewership data since that really has nothing to do with the other data.